I was interested in reading an article in today’s Southend Echo, titled “‘Aggressive beggars terrorise our streets’ according to residents and councilors”. Some of it was to do with begging in other places in Essex, besides Southend, concerning which I am more familiar with because of my “homeless” work over the years. What Sgt Hughes said (assuming the Echo quoted him correctly) was spot on and while homeless folk sometimes complain that police deal with them more harshly than they feel they should, I have usually found the Police approach sympathetic toward the genuine homeless and balanced given the pressure that is put upon them of ridding the High Street, not just from beggars who may or may not be homeless but also from the genuine homeless, who may or may not be begging. The matter of begging in the High Street has been around, before I made my first homeless blog written over three years ago, “Myths about rough sleeping”, which included an attempt to address what even then was a thorny subject. Given my work among the homeless, I know many of those that turn up in and around the High Street, most of which do not beg, as well as those I don’t recognize, some of which do beg, and a few do so aggressively. 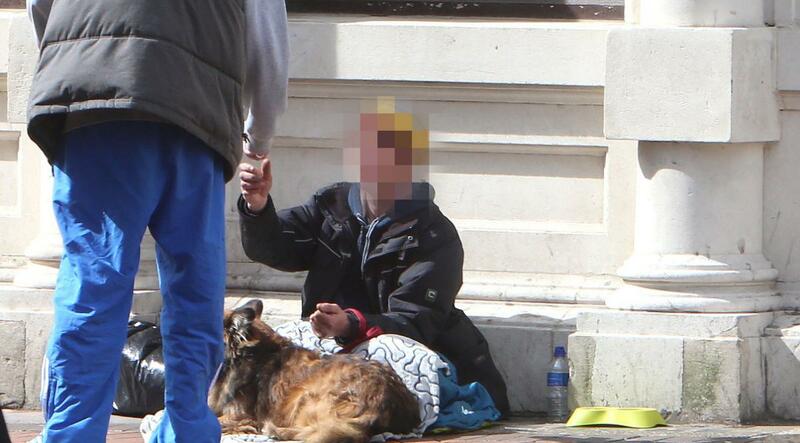 It is often difficult for passersby to decide whether someone asking for a hand out is genuine of not, and even if they really are homeless, how best to respond. It is easy for councils to adopt harsh solutions that penalize those who do beg and this may extend to those who merely present as being homeless in areas around main thoroughfares, like High Street. They need to be challenged if by moving on the homeless results in nowhere better for them to go. My views on how as an individual one can respond are broadly the same as they always have been. I agree with Sgt Hughes, if we are to respond practically then do so but best not to give money, and if that is not possible affirm that person’s humanity given the “Good Book” tells us to “love our neighbour as ourselves”. While there are professional beggars who deserve short shrift (although many of these may also be victims) there are many who are living on the streets due to circumstances they may have little control over. While some do not avail themselves of helps that are available, it is worth reminding those we engage with of the various helps that are available even though often when we do it seems to fall on deaf ears. While I agree aggressive begging does go on, and have seen it first hand, and some if it is of a terrorizing nature, I can’t say to what extent and suspect the headline may be overstating the case and can lead to anti homeless sentiments. I wish I had a simple solution to a problem of homelessness that is looking as if it is getting worse. Sometimes it leads to the homeless begging and the disingenuous pretending they are homeless. Even if done in a non aggressive way it can be a disagreeable and problematical prospect to face. That which gives rise to people becoming homeless and maybe resorting to begging is often too much for any one of us to deal with, but it is possible for any one of us to do something to help. I would say to those who are approached by beggars: be firm as to what you can / will and can’t / won’t do, don’t be intimidated, and be kind.